FatShark is excited to announce the Ready-To-Fly FPV SpyHawk airplane bundle for the ultimate immersive FPV experience. The SpyHawk is the ideal aircraft for inexperienced pilots as the gyro/accelerometer flight stabilized plane will level itself when you let go of the controls. As soon as you pull the optional goggles over your eyes you will be flying from the RC Model's cockpit experiencing the freedom and sensation of real flight at a level far above what can be felt by just looking at an LCD screen. Also you can pilot by a monitor TFT-LCD. If you are going to try FPV, do it with the best equipment. The Fat Shark SpyHawk bundle offers a option with wireless VGA resolution and optional FPV headset that operates independent from the aircraft and can be used with future FPV projects for years after you have outgrown your SpyHawk plane. Get on the right FPV track from the beginning. Get FatShark gear. Get hooked on FPV with the RTF plane and Fat Shark will ensure there will be plenty of FPV upgrades to satiate your widest FPV dreams. NOTE: Supplement Shipping for Large Package to any country other than Spain and Portugal. 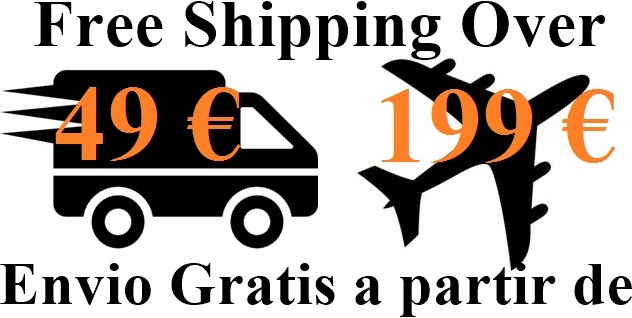 If we have to ship outside Spain or Portual, please choose the option extra box intenational shipping.